Puritans did not find a life free from tyranny in the new world—they created it there. Massachusetts emerged a republic as they hammered out a vision of popular participation and limited government in church and state, spurred by Plymouth pilgrims. 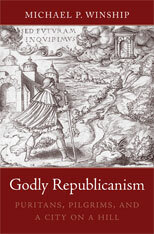 Godly Republicanism underscores how pathbreaking yet rooted in puritanism’s history the project was. Michael Winship takes us first to England, where he uncovers the roots of the puritans’ republican ideals in the aspirations and struggles of Elizabethan Presbyterians. Faced with the twin tyrannies of Catholicism and the crown, Presbyterians turned to the ancient New Testament churches for guidance. What they discovered there—whether it existed or not—was a republican structure that suggested better models for governing than monarchy. The puritans took their ideals to Massachusetts, but they did not forge their godly republic alone. In this book, for the first time, the separatists’ contentious, creative interaction with the puritans is given its due. Winship looks at the emergence of separatism and puritanism from shared origins in Elizabethan England, considers their split, and narrates the story of their reunion in Massachusetts. Out of the encounter between the separatist Plymouth pilgrims and the puritans of Massachusetts Bay arose Massachusetts Congregationalism.